A night of high-quality musical comedy theatre is on offer at St Andrews Parish Centre, Sandhills Road, Barnt Green B45 8NR on Saturday April 16. 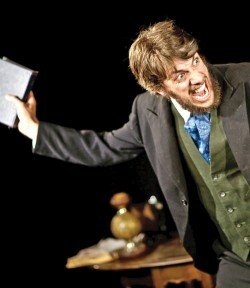 The Origin of Species is an uproarious musical-comedy solo show telling of Charles Darwin’s discovery of the secrets of evolution. It’s packed with fascinating facts, terrible puns, brilliant physical comedy and witty original songs about everything from boring barnacles to the perils of marrying your cousin. Performed by Tangram Theatre (http://www.tangramtheatre.co.uk), the 70-minute show is suitable for adults and older children (11+) and will especially appeal to fans of interactive theatre and BBC’s QI / Infinite Monkey Cage / Dara O’Briain’s Science Club. Bar open from 6.45pm and during the interval. The show starts at 7.30pm and tickets cost £10 (adult) and £8.50 (Senior: 65+ or Junior: 11 to under-18). Family ticket (2 adults + 2 juniors) £34.50.